TV show dates: January 18, 2017 — August 1, 2018. Performers include: Walton Goggins, Barry Sloane, Kyle Schmid, Juan-Pablo Raba, Edwin Hodge, Dominic Adams, Brianne Davis, Nadine Velazquez, Jaylen Moore, Donny Boaz, and Nondumiso Tembe. 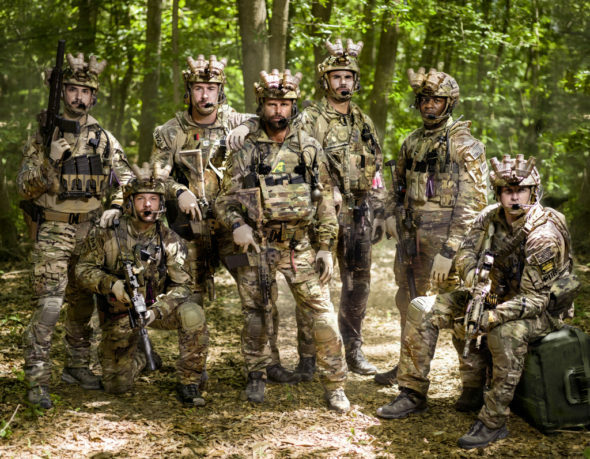 This military combat drama series revolves around modern American warriors, the members of Navy SEAL Team Six. Their covert mission to eliminate a Taliban leader in Afghanistan goes awry when they uncover a U.S. citizen working with terrorists. A commanding leader and brilliant soldier, Richard “Rip” Taggart (Walton Goggins) has served valiantly for 17 years as a SEAL, eleven of those on SEAL Team Six. However, fighting an endless war and facing unspeakable atrocities have taken their toll. Exiled from the Team and the SEAL life that defined him, Rip has cut all ties to his teammates and his family and is doing contractor work for money in Nigeria. After he’s captured with a strong-willed Nigerian teacher (Nondumiso Tembe) and her schoolgirl students, Rip has to rediscover his SEAL identity to save them. Along the way, he struggles to rediscover his humanity. Rip’s former SEAL Team Six brothers reunite to put their differences aside to locate and rescue their former troop leader. From a troubled family in mining country, Joe “Bear” Graves (Barry Sloane) is mentally tough, stubborn, and most of all, prepared. Being a SEAL gives Graves structure and purpose. Rip was his role model and when Rip leaves the team, Graves loses the most important member of his SEAL family. He’ll risk everything to save Rip. Lena (Brianne Davis) is his devoted schoolteacher wife. A freethinking warrior-philosopher, Alex Caulder (Kyle Schmid) was raised by an absent mother and quickly learned that he couldn’t count on anyone. He believes that his disconnectedness makes him the ultimate warrior because he has nothing to lose. When Caulder’s estranged daughter, Dharma, suddenly shows up in his life, he’s unnerved by it. Will their growing connection be a source of strength, or his Achilles heel? Unflappable, loyal, and good-hearted, Ricky “Buddha” Ortiz (Juan Pablo Raba) grew up in a large family in South Texas, raised by first-generation immigrants from Mexico. On the team, he keeps the peace and cherishes his family. He knows how good he has it with his wife Jackie (Nadine Velazquez) and their two children. Privately, Ortiz is worried about what his life will look like if he leaves the Team. A first generation Afghan American, Armin “Fishbait” Khan (Jaylen Moore) was born in Oakland. A practicing Muslim, he’s the sniper on the team, and relied on for his fluency in several Middle Eastern languages. Robert Chase (Edwin Hodge) was a former law student at Harvard before joining the SEALs. Now he’s the new guy on Six, and he has to fight to be a part of the team while battling the expectations of his home family. Michael Nasry (Dominic Adams) is a first generation American of Lebanese descent from Michigan. After 9/11, he and his family faced anti-Muslim discrimination. Then, when his father was nearly beaten to death, Michael was radicalized. He traveled to Afghanistan to fight against his own countrymen, and quickly rose in the insurgent ranks. But, as an American, he was always an outsider, and convinced his younger brother Omar to leave Michigan and fight with him in Afghanistan. When Michael watches Rip kill Omar, Michael swears vengeance. What do you think? Do you like the Six TV show? Should it have been cancelled or renewed for a third season on History? I really liked the show I don’t feel it should have been cancelled. it. What a loss. You paid tribute to all our troops and civilians who’ve served. What a shame to loose a show like this. Hope all of you land great jobs fast! You deserve it. I am EXTREMELY disappointed with History Channel for canceling Six!!!! This is the only drama I ever watched besides IRT on this channel and I am to the point now that I don’t care if I even have this channel in my lineup anymore. You guys are really disappointing. I know that person who I can’t call names had a hand in product or whatever but hell, everyone is replaceable!!!! I agree!!! My ex is from Louisiana so my boys watch Swamp People and I do kinda like Troy Landry’s show ‘Swamp Monsters’ but honestly we could do without that. I loved Six and have been searching for it for months. Only when I search on Bing do I find out the story is over without a real ending. At least give us a way to see it through to the end! !